soft plastics and live bait combined. Last week we took a look at how to find first ice crappie. This week we’re taking a deeper look into tactics for catching them. Historically I’ve caught most of my early winter crappie on a small jig tipped with two or three wax worms, mousies or spikes. Bulking up the jig with lots of bait causes the jig to sink slower and more deliberately. Also, should I miss a fish, there is a very good chance the jig will still have bait on the hook and I just might get a second shot at that fish. My jig of choice has for years been the Bait Rigs Panfish Cobra because it has an offset hook that readily allows me to pack on the bait. This jig is produced in four sizes including a No. 10, 12, 14 and 20 size. 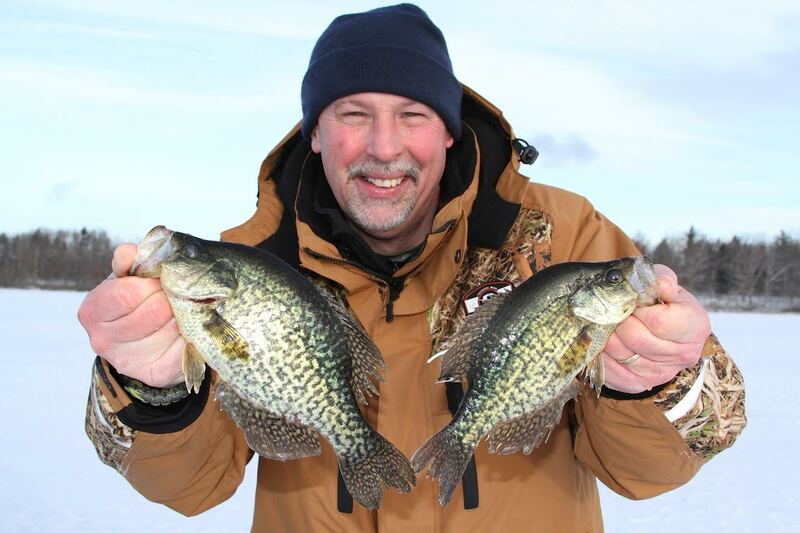 In recent years soft plastics have started taking over the show when it comes to early winter crappie fishing. I’ve discovered as have a lot of other anglers that small soft plastics made especially for ice fishing will work as well as live bait most of the time. For those anglers who just don’t have confidence in fishing soft plastics under the ice, I suggest rigging up with both soft plastic and live bait. The Panfish Cobra is ideal for this strategy because the offset hook allows enough room to thread on a soft plastic bait and still tip the hook with a wax worm, spike or other live grub. Finding crappie is one thing, but teasing them into biting is another. When crappie are aggressively feeding they will usually hit the jig on the first drop. If they don’t bite right away, I can tempt most into biting by slowly jiggling the bait just above them and by raising the bait up and out of their field of view. Crappie feed upwards in the water column. Showing the fish the bait and then taking it away will stimulate the majority of these fish to give chase and bite. To accomplish this requires a good sonar unit that’s capable of not only marking fish, but also showing your bait in the water column. Many anglers argue that a flasher unit is the best for ice fishing. These anglers are quick to point out that flashers are real time, a feature that allows signals like fish marks to appear on the dial at the same instant the fish appears. These same anglers argue that a delay of several seconds occurs on a typical liquid crystal display type sonar unit. Not that long ago this statement was true, but modern sonar is another story. The images displayed on a liquid crystal sonar unit appear just as quickly as images on a flasher unit. Because it takes several seconds for fish marks that appear on a LCD screen to scroll from right to left, those marks are visible for a longer time. This is actually an advantage because with a flasher unit the angler has to watch the display constantly to stay on top of fish movements. Look away from the flasher for a second to pour a cup of coffee and vital information may appear and disappear before the angler even sees it. 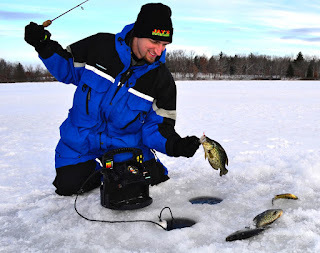 The bottom line is both flasher and liquid crystal display sonar units are viable options for ice fishing these days. It really becomes a matter of personal preference. Underwater video units have also come a long way in recent years. Not only do these units provide a clear view of the underwater environment modern units feature color displays and they feature a rotating lens that makes it easy to spot your lure, fish and other targets of interest. In my mind video shines best as a tool for locating and confirming specific habitat types. On a flasher or LCD graph the images that are returned are sometimes hard to decipher. With video what you see is what you get. It’s very easy to confirm the presence of fish, the species of fish and the relative size of those fish. It’s also easy to recognize aquatic weeds, submerged wood, rocks, gravel and other bottom types that routinely attract and hold fish. In fairness it’s hard to say that one type of sonar is better than another, but it’s safe to say that using two different types like a flasher and a video unit together really helps anglers put together the pieces of the puzzle. Setting up and using two different fish finding units is for sure more expensive and time consuming, but the benefits weigh in as more and bigger catches.